Pixie haircuts are short and choppy and can be flattering for the right face shape. 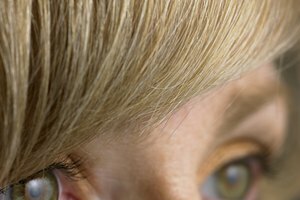 A professional stylist can help you get the best shape, but there are ways to achieve an attractive basic pixie style in your own home with a few tips. Wash and condition your hair. Your hair should be completely clean before cutting. Dirt and oil will damage good-quality thinning shears, so clean hair is a must. Separate a 3-inch-wide section of hair and use the fine-tooth side of your comb to hold the rest of the hair back. It is recommended that you choose a piece from the front sections of hair first. Make sure to leave a 2-inch-wide section at the front untouched; those will be your bangs to shape later. If you don't want bangs, feel free to pull the section back and trim as you wish. Hold the thinning shears diagonally above the section and trim the the hair with the shears pointed downward. This will keep the volume at the top, where it is most flattering. Be sure that you start the cut 2 1/2 to 3 inches below the crown to prevent too much height. Shape your bangs with the shears. Start by parting your hair on your preferred side and singling out a 2-inch-wide section of hair in the front. Trim with the shears pointed down starting at whatever length you prefer. Use a ruler to measure the length if you are unsure. Use the wide-tooth comb to comb the hair and survey your first cuts, and use them as a guide. The length of your haircut has been set by the initial cuts. Just follow along the ends and cut to make the sides match. Do not touch the hair at the back of your head yet. Trim the hair at the back of your head slightly shorter than the front and sides. You will not cut diagonally to create volume; this cut should be even. Hold the shears parallel to the floor and cut one even line at the nape of the neck. Use the wide-tooth comb to separate the top section of hair, measuring from the crown to 3 inches from the nape. The top section should be at least 2 inches thick and no longer than 4 inches long. Cut that section at the 4-inch mark, again with the scissors parallel to the floor. Again, a ruler should be used to keep the cut uniform if you do not have a steady hand. Apply spray gel to the hair and brush it through with the vent brush. Blow dry the hair using the vent brush to smooth and shape your new cut. Run your fingers through your new pixie cut to create a spunky look. Check frequently during cutting to make sure you are getting your desired shape. If you have a round face shape, a less drastic, layered pixie cut will look best on you.